In this day and age criminals are looking for an trouble-free target. If they meet too much resistance they will go elsewhere. 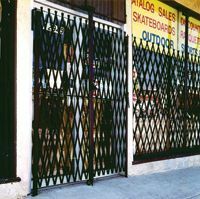 Our storefront gates offer a ideal mixture of high security and a visual deterrent to help defend companies and avoid break-ins. Outdoor mounted gates help guard against glass breakage & graffiti but stay more noticeable during daylight hours. The presence of a storefront gate is usually enough of a deterrent to drive burglars on to find easier targets. We have over 1000 in stock storefront gates that can stand up to sever weather like heat, rain and snow and they will not be harmed by corrosive commercial chemicals and solvents. Our gates have a galvanized finish that is in effect maintenance free and delivers the best in security with a good return on your investment. If you can not find what you are looking for call one our security gate experts for a free consultation and quote.